The costar of the Jerry Seinfeld documentary Comedian has also been seen on MTV’s Teen Wolf and The Late Show with David Letterman. Limit 4/person. Valid only for option purchased. Reservation required, call 847-240-2001. Redeem on day of show for ticket at venue box office. 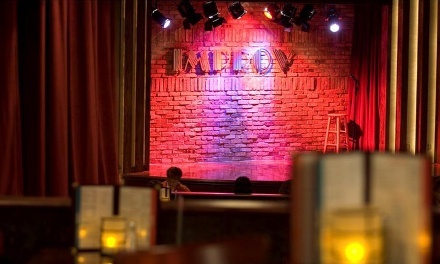 Must show valid ID matching name on Groupon at The Improv Comedy Club. Refundable only on day of purchase. Discount reflects The Improv Comedy Club's current ticket prices-price may differ on day of event. Door time varies per show. For ADA seating, call box office promptly upon receipt of voucher-availability limited. 2-item min./person required of any food/beverage combination. Must be 18+ w/ valid ID.